Evil Genius is set in real-world Sydney, but it is driven by a compelling fantasy: what would it be like to wield power that can change the world? Cadel Piggott, the protagonist of the novel, is a genius. We first meet him, aged seven, in the office of psychologist Thaddeus Roth, where he has been escorted by his adoptive parents after being caught hacking computer systems. Lovable kid-genius characters, like Roald Dahl’s Matilda, are often empowered by their intelligence to escape the limitations imposed by uncaring adults. Cadel, too, has negligent parents, and his intellectual abilities lead him to an alternative family: Thaddeus becomes an influential father figure, as well as introducing Cadel to the man described as his real father, the imprisoned Phineas Darkkon. But Thaddeus and Phineas are revealed to be criminal masterminds, and as Cadel grows up they put increasing pressure on him to join their villainous activities. As the novel progresses, Cadel must confront the dark side of power and its potential to hurt people. 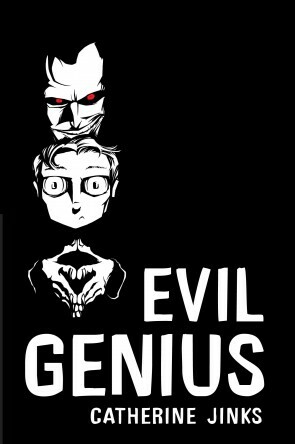 Evil Genius, then, is not a children’s book like Dahl’s Matilda, but a coming-of-age young adult (YA) book. Author Catherine Jinks is adept at working with this category, having won several awards and written more than thirty books for young readers. The term YA is a relatively recent way to conceptualise books, with S. E. Hinton’s The Outsiders (1967) being one of the earliest recognisable antecedents for contemporary YA. In some ways, YA is an unusual category. It’s not quite a genre, because YA books can be science fiction, crime thrillers, romances, contemporary realistic fiction or anything else. YA books do tend to share a focus on young people and an interest in the social predicaments they face; at their best, YA books are inclusive, sensitive and relevant. YA also functions strongly as a marketing category, linked to the way a book is formatted and distributed, and many titles have been extremely commercially successful over the past few decades with both younger readers and adults. YA is a distinctive category, but it also has continuities with the wider corpus of literature. One tradition that many YA books belong to is the bildungsroman. A bildungsroman is a novel dealing with a person’s spiritual, moral and mental development over their formative years. The Harry Potter series follows the bildungsroman arc, so does Ursula le Guin’s A Wizard of Earthsea (1968), and so do many literary classics. Charles Dickens’ David Copperfield (1850), for example, is about a young English boy’s growth into maturity and independence. Its famous first line reads, ‘Whether I shall turn out to be the hero of my own life, or whether that station will be held by anybody else, these pages must show.’ Historically, many bildungsroman stories have been written by and about heterosexual white men, but in recent years YA bildungsromans have encompassed more diversity. Australian examples include Indigenous author Sue McPherson’s Grace Beside Me (Magabala Books, 2012) and Lebanese-Australian author Sarah Ayoub’s Hate is Such a Strong Word (HarperCollins, 2013). In Evil Genius, Cadel’s coming-of-age happens in two distinct phases. The first is a gloriously fun, fast reading experience, as Thaddeus and Phineas encourage Cadel to test and increase his intellectual powers by causing traffic jams, making buildings fall down and wreaking havoc at school. Around a third of the way into the book, Cadel hits the age of fourteen and the pace slows to explore this key growth period. Cadel learns more about his true identity and moves towards maturity, developing the emotional and moral resources he will need as an independent adult. The coming-of-age narrative is interwoven with the conventions of another genre: the crime thriller. (In fact, Evil Genius won a Davitt Award for Best YA Crime Fiction.) Cadel wrestles with his personal challenges in the midst of high-stakes criminal activity. Initially, it seems that this will be a crime novel with a twist – the protagonist is the criminal, not the detective. Cadel begins his criminal career with a sort of innocence, driven by curiosity combined with a lack of empathy. As the book moves into its second phase, Cadel’s pranks escalate and become more malicious. This reaches a peak when, motivated by spite, loneliness and rejection, he sabotages the Year 12 exams of his classmates. Cadel’s slide towards villainy is interrupted at a key moment. After Cadel graduates from high school, Thaddeus encourages him to enrol in the secretive, exclusive Axis Institute, founded by Phineas. Cadel is horrified when he learns that this institute offers classes in poisoning and bomb-making. This is a moment of awakening. While Cadel suppresses his concerns and attends the institute, his growing doubts and moral sensitivity eventually lead to his rejection of Thaddeus and Phineas, and his determination to destroy the Axis Institute. The crime story pivots; Cadel becomes hero rather than villain. At this point, the book takes off as a crime thriller. In his book Popular Fiction (Routledge, 2004), Ken Gelder writes that the ‘logic of the modern thriller’ includes ‘melodramatised events, a sequence of sharp climaxes, fast dialogue and short paragraphs’ and this logic pervades the later sections of Evil Genius. At the Axis Institute, Cadel’s ‘nerves were always taut; there was never a moment when he didn’t run the risk of being spied on, or attacked, or taunted, or ambushed’. As the plot ratchets up, Cadel becomes a hero on the run from both the police and from a widespread, many-tentacled criminal organisation. He takes risks, is captured, escapes and is captured again, with both his life and the future of the world at stake. The crime fiction elements provide the adrenaline of the book, but affect the novel at a deeper level too. Crime fiction depicts disruptions of the social order, and its narrative arc can be conservative: a crime disturbs society, the detective identifies the criminal, and society can safely return to the status quo. Arthur Conan Doyle’s Sherlock Holmes stories and Agatha Christie’s novels tend to follow this classic crime narrative. Yet these books aren’t always completely reassuring, and can leave the reader with a lingering sense of menace. In crime thrillers, this feeling is magnified by the constant awareness of evil forces much bigger than the detective. Often there’s a hint that deep, underlying problems could bubble up again. In Evil Genius, Thaddeus and Phineas pitch themselves as the answer to society’s problems, presenting the Axis Institute as ‘the seed of a new world order’. They articulate a powerful urge to remake society, which is present in much YA fiction. As YA writer Tim Sinclair observes, the idea of wiping the slate clean and building a new society can be empowering for teen readers. However, in Evil Genius the desire to create a new world is a malevolent force. Thaddeus and Phineas’s solution to the mess of contemporary human relations is to create a new ‘two-tier society of genetically superior overlords and a genetically inferior underclass’. Though never named as such, this is eugenics, a school of thought associated with the Nazi Party and ethnic cleansing. Evil Genius, then, like many novels with a touch of fantasy, dramatises clashing moral codes. It is interested in the nature of good and evil, the opposition between them and the moments when the lines appear to blur. In an Axis Institute class on morality, the villainous Maestro Max tells his students that ‘evil’ is merely a word used to condemn people that society doesn’t like: what ‘people call evil is a respected philosophy of life known as “Survival of the Fittest.”’ Thaddeus smoothly advises Cadel to ‘free up your thinking a bit. That’s all.’ But the novel makes clear that while free-thinking may be alluring, it is dangerous. What Cadel lacks is not free-thinking but its opposite, a moral anchor. After Maestro Max’s class, Cadel decides that he has relied too much on Thaddeus’s guidance and lacks his own sense of right and wrong. This is a pivotal moment in Cadel’s growth. Thaddeus and the Axis Institute were supposed to open Cadel up to an instrumentalism that sees weak people as expendable, but instead Cadel’s reflections on morality lead him in a different direction, towards appreciation of other people. Cadel’s journey to maturity involves learning to develop robust and meaningful social connections. Over the course of the novel, he moves from being a total loner to developing two significant friendships – with Gazo and with Sonja. Friendship requires Cadel to cultivate empathy, and thus to separate himself from the cold, instrumental approach to human relationships advocated by Phineas, Thaddeus and the Axis Institute. The value of friendship is this novel’s strongest driving force. Nascent, genuine connections with his peers catalyse Cadel’s transformation from villain to hero; they are what make him reject the Axis Institute and set in play the thriller elements of the novel. At first, the friendship between Cadel and Gazo seems insubstantial and unlikely. Gazo emits such strong body odour that he has to wear a protective suit in public. He has been plucked from homelessness in England and transported to the Axis Institute to be studied by Phineas: he is hapless, naive and much less intelligent than the other students. Yet he is also nice, and his friendly overtures confuse Cadel. When Phineas and Thaddeus observe this emerging friendship, they dismiss Gazo as a ‘clumsy tool’ that Cadel can use. However, as the plot progresses, Cadel learns to appreciate Gazo’s value. Gazo is faithful and caring, self-sacrificing and loyal, and he inspires these qualities in Cadel too. The development of this reciprocal, non-rational friendship is essential to the transformation of Cadel’s character. The deepest and most interesting friendship in the novel is the one that Cadel forms with Sonja. This friendship begins as part of an online scam run by Cadel, and their initial messages to each other are filled with fabrications. However, they also begin to genuinely share their doubts and loneliness and form an invigorating intellectual bond. When Cadel finally meets Sonja, he learns that she has a severe physical disability. Cadel is shocked by the extent of her physical limitations, but rapidly, matter-of-factly assimilates this information and continues to prize Sonja’s wisdom and intelligence and value their friendship. This is mirrored by Sonja’s response: after her initial shock at learning of Cadel’s fraud, she accepts Cadel’s emotional complications and forgives his moral failures, maintaining their bond. Evil Genius speaks up strongly for the values of empathy and respect. These form the moral bedrock that anchors Cadel’s intelligence. At the end of this book, which is the first in a trilogy, Cadel has made the crucial decisions that will shape his character. His friendships with Gazo and Sonja are strong rebuttals to Phineas and Thaddeus’s contempt for human weakness – the ethical grounding he needs in order to come of age. Cadel’s intellect is dazzling and entertaining, but it is his growing understanding of the connections between people – with all their surprising, diverse limitations and gifts – that is the profound heart of the novel. Ayoub, S 2013, Hate is Such a Strong Word, HarperCollins, Sydney. Brown, JE and Stephens, EC 1995, Teaching Young Adult Literature: Sharing the Connection, Wadworth Publishing Company, Belmont. Buckley, J 1974, Seasons of Youth: The Bildungsroman from Dickens to Golding, Harvard University Press, Massachusetts. Dahl, R 1988, Matilda, Jonathan Cape, London. Dickens, C 1997, David Copperfield, Oxford University Press, Oxford. Gelder, K 2004, Popular Fiction: The Logics and Practices of a Literary Field, Routledge, New York. Hinton, SE 1970, The Outsiders, Gollancz, London. Knight, S 1980, Form and Ideology in Crime Fiction, Indiana University Press, Bloomington. Le Guin, U 1968, A Wizard of Earthsea. Parnassus, Berkley. McPherson, S 2012, Grace Beside Me, Magabala Books, Broome. Moretti, F and Sbragia, A 2000, The Way of the World: The Bildungsroman in European Culture, Verso, London. Rowling, JK 2007, Harry Potter and the Deathly Hallows, Bloomsbury, London. Scaggs, J 2005, Crime Fiction, Routledge, New York. Sinclair, T [under embargo], Twice Upon a Time: Starting Over After the Apocalypse, PhD thesis, Barr Smith Library, University of Adelaide. Beth Driscoll is Lecturer in Publishing and Communications at the University of Melbourne, and author of The New Literary Middlebrow: Tastemakers and Reading in the Twenty-First Century (Palgrave Macmillan 2014). She researches contemporary book culture, publishing and reading and is currently engaged on two projects funded by the Australian Research Council: on contemporary genre fiction, and on post-digital literary culture. She has written about books and reading for The Australian, the Sydney Review of Books and Meanjin.